The drivers that may have competed for Lotus and Ferrari, depending upon the manufacturers’ motives, could have been some of the best CART drivers of all time. Lotus likely would have brought its Formula 1 drivers to Indianapolis, as the team did in its 1960s heyday, which would have seen Ayrton Senna, and eventually Nelson Piquet, try their hand at the Indianapolis 500. Senna would have flirtations with CART anyway, testing Emerson Fittipaldi’s Penske Racing challenger at Phoenix in December 1992, while Piquet attempted to qualify at Indy twice after his F1 career, suffering serious injuries in practice in 1992 and finishing 32nd in 1993. Lotus’ CART ride could have also served as a stopover for the team’s test drivers, allowing them to race a full year in competitive equipment instead of spending time with mediocre F1 equipment. One driver who could have benefitted was Derek Warwick, who nearly drove for the team in 1986, only to have his signing vetoed by Senna. A full year in a competitive CART drive could have established Warwick as a consistent, winning driver, opening up better rides for him, instead of leaving him one of the most talented drivers to never win an F1 race. As for Ferrari, they could have fielded three ultra-competitive CART entries in 1987 had they followed through on some of Enzo Ferrari’s threats to leave F1 entirely. The Rahal-Truesports combination would have been strong as it was, but had the political posturing led to serious action (and calling Ferrari’s bluff, historically, leads them to follow through), the team feasibly could have brought over Michele Alboreto and Stefan Johansson, its 1986 driver pairing, to the series as well. Both would make their way to Indianapolis in the mid-1990s anyway; Alboreto joined the Indy Racing League in 1996, finishing in the top eight in all of his races but that year’s 500, while Johansson may best be known for bumping Penske Racing out of the 1995 race entirely. Instead, neither program was meant to be. Ferrari engine technology used on the 637 was eventually passed on to Alfa Romeo, which had been looking to improve market share in the United States, but the car debuted with a purpose-developed March chassis. In three years of competition, Roberto Guerrero and Danny Sullivan failed to score a single race win, podium, or pole position, and eventually Alfa backed out. Of course, that’s better than Lotus’ debut year as an engine supplier has been this year; left with two cars at Indy due to a series of defections and a lawsuit from Dragon Racing, there are serious doubts as to how long their IndyCar program will last. If only both companies had entered CART in the 1980s. Who knows what we’d see at Indy this year. While Lotus’ CART challenger had been built with the dream of a new international series in mind, Ferrari’s challenger may have had more political motives. The FIA had been looking to make V8 engines compulsory in Formula 1 in the mid-1980s, while Ferrari had been running V6s since 1981. Ferrari had only run V8 engines in F1 in 1964 and 1965; while John Surtees won the 1964 championship in the car, the team switched to primarily 12-cylinder engines in mid-1965. CART, meanwhile, had always run 2.65-liter turbocharged V8s. As such, developing a car for CART competition offered leader Enzo Ferrari two options for his team: a bargaining chip to force the FIA to back down if it wanted to keep one of its most storied teams, or an opportunity for the company to build a sort of “practice” turbocharged V8, with the ideal that some of the technology would carry over to F1. Ferrari has never entered a competition it didn’t think it could win, and sometimes that means bringing in others to help achieve that goal. So Ferrari contacted Jim Trueman, owner of the competitive Truesports team, on the recommendation of tire supplier Goodyear. Trueman and driver Bobby Rahal were coming off a wild 1985 season that saw them finish third in CART points despite ranking 20th through seven of 15 races. But Rahal had won three of the last six races of the year, and led by manager Steve Horne, the team would be poised to contend for the 1986 title. After the season, Rahal and Truesports were invited to Italy to demonstrate the March 85C-Cosworth that most CART teams used. Afterwards, Ferrari’s lead F1 driver, Michele Alboreto, would try the car, and Ferrari would disassemble and study the vehicle in order to better understand it before building their own challenger. Ferrari unveiled their car, the 637, in 1986, with Alboreto again turning the majority of laps. Meanwhile, Truesports would put together its finest season in 1986. Though the team once again suffered a series of issues early in the year, Rahal would lead 58 laps on the way to winning the Indianapolis 500. Owner Trueman passed away 11 days later after a lengthy battle with cancer; the team would dedicate the rest of the season to his memory, winning five more events. The potential combination of the series’ best team and racing’s most prominent manufacturer for 1987 could have put the rest of the series to shame. But it wasn’t to be. Depending on who you ask, one of two things happened: either Ferrari backed out at the last minute after a change of intent, or the team had never intended to race in CART at all, simply using the program as a very serious ploy to gain F1’s attention. Originally, the plan had been to enter a one-off entry at Laguna Seca in one of the final races of 1986 (a race that Rahal won) before campaigning the full 1987 schedule, but the car withdrew at the 11th hour. Chief designer John Barnard made the call to abort the program and focus on F1; Horne believes that this was truly a last-minute decision, rather than an attempt to use CART as a threat. In fact, the aborted Ferrari program facilitated what would become a lengthy downward slide for the Truesports team. 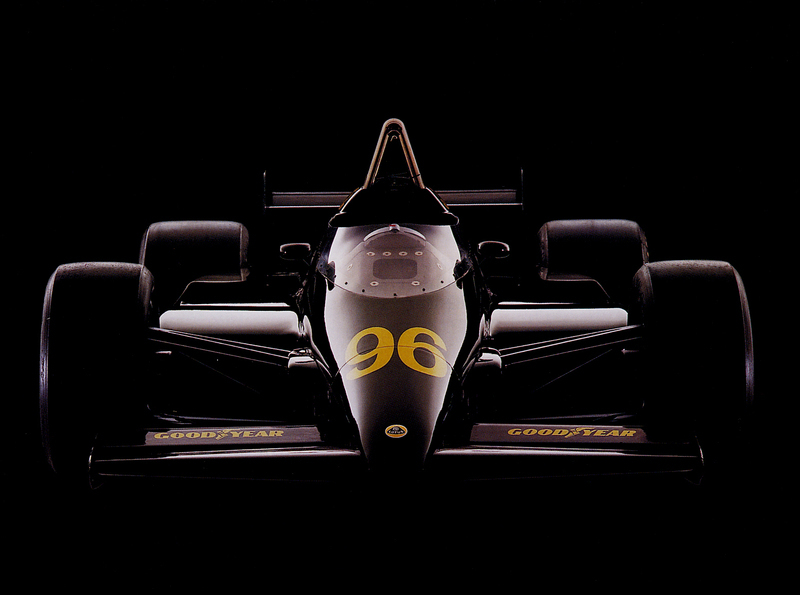 Chevrolet, with its competitive Chevy Indy V-8, offered engine leases to most of Truesports’ competitors, such as Penske Racing, Patrick Racing, and Newman/Haas Racing, but Truesports was shut out. Rahal would defend the championship regardless, but not the Indy 500. The next year, the team would switch to underpowered Judd engines, and the lack of a competitive motor would inspire Rahal to race elsewhere. Truesports would push on with Scott Pruett and Raul Boesel, but after slipping to 11th in points in 1992, the Trueman family would sell the team to Rahal and trucking magnate Carl Hogan. The demise of CART was preceded by a series of serious mistakes in the 1990s and 2000s, but none of them should be considered its greatest lament. Forget its decision to boycott Indy Racing League events, including the Indianapolis 500, and establish its own competing race. Forget the financial mismanagement that came from its public IPO that led to bankruptcy. Forget, even, the failure to regulate its cars at Texas in a way that would prevent drivers from blacking out during the high-banked, high-speed turns. CART’s biggest missed opportunities came in the 1980s. Their names were Lotus and Ferrari, respectively. Lotus may be in the sport now, having joined KV Racing Technology as a sponsor in 2010 and stepping up as an engine manufacturer this year, but long before then, they built a CART racer, the 96T, in 1984. Ferrari, meanwhile, unveiled its own competitor, the 637, in 1986, with drivers Bobby Rahal and Michele Alboreto among those connected to the project in some way. Unfortunately, neither car ever made it to the track on a race weekend. The promise that both manufacturers offered, and the fact that American open-wheel racing was considered a worthy endeavor for two of the most storied and competitive teams in Formula 1, both went for naught. When Lotus set out to establish a CART team, they hadn’t run a works team at Indianapolis since Colin Chapman took Jim Clark and others to the Speedway from 1963 to 1969. They took the win in 1965 with a rear-engined car that helped revolutionize the sport. With their pedigree, any re-entry into open-wheel racing in the States would inspire great expectations in fans and rivals alike. Former Formula 2 owner Roy Winkelmann saw the establishment of CART in 1979 as a way to break back into racing after a decade spent cultivating a business empire. Winkelmann decided that the best way to conquer the new series would be to secure “works” engines from Cosworth, as the 2.65-liter DFX V8 powering most CART entries featured little input from the manufacturer. He was confident that he could secure the sponsorship, drivers, and car to conquer the sport within three years. Winkelmann then went to Lotus, enlisting French designer Gerard Ducarouge, who had been consistently rebuilding Lotus’ F1 team with a series of innovative designs in the early 1980s. Ducarouge and a young Mike Coughlan designed the new car with the Lotus 95T, their 1984 F1 challenger, in mind, but with alterations made to compensate for the possibility of hitting a wall at much higher speeds. The 96T had a serious shot at dominating the series, given the strong pedigree of those behind it, but it wasn’t meant to be. CART, a series formed by the activism of team owners, wasn’t particularly excited at the prospect of a “works” team with any sort of factory support. The apprehension makes sense, given the possibility of an upstart team with better chassis, newer engines, and deeper pockets dominating the people who actually established the series. In response, sponsorship failed to materialize, and drivers weren’t willing to risk their careers to join the new team. Instead, the car never ran, and some of the design cues from the 96T were applied to Lotus’ next Formula 1 car, the 97T; in particular, subsequent Lotus F1 cars used aluminum foil honeycomb rather than nomex between Kevlar their parts. After a few years of poor results in the wake of Chapman’s death, the 95T had brought Lotus back to competitive form in 1984, but its inability to win chased off driver Nigel Mansell to the Williams team. The team replaced Mansell with a young driver named Ayrton Senna (perhaps you’ve heard of him), and he took his first two career F1 wins in the 97T. Senna and teammate Elio de Angelis would rank fourth and fifth in points, respectively, in the 1985 F1 season. Millions of fans would disagree to this day. Eighteen years ago today, one of the worst weekends in Formula 1 history ended when Senna passed away in an accident during the San Marino Grand Prix. His incident came two days after a then-young Rubens Barrichello suffered serious injuries in practice, and one day after Austrian Roland Ratzenberger perished in a crash during qualifying. In an eerily foreboding move, on the morning of his death, Senna set into motion the re-establishment of the Grand Prix Drivers’ Association to push for greater driver safety in the wake of these accidents. While many of his records have been surpassed, Senna’s name remains a staple of the Formula 1 record book. At the time of his death, his 41 wins ranked him second all time, and his 65 poles were one short of doublingsecond place in the category before Michael Schumacher surpassed him in 2006. He won four consecutive races on two separate occasions, three championships (in 1988, 1990, and 1991), and six Monaco Grands Prix. Senna was a throwback, one of the last remaining drivers who asserted himself as a leader in the sport with businesslike efficiency and surgical precision. Beating his opponents was nothing personal; it was just his job. And like any effective mercenary, jarring emotions would not compromise his set of skills, especially not a hostile work environment. While Alain Prost purposely signed contracts to block Senna from joining the same team and Nigel Mansell took a two-year detour into CART while still holding his Drivers’ Championship, Senna was out there to race and nothing more. 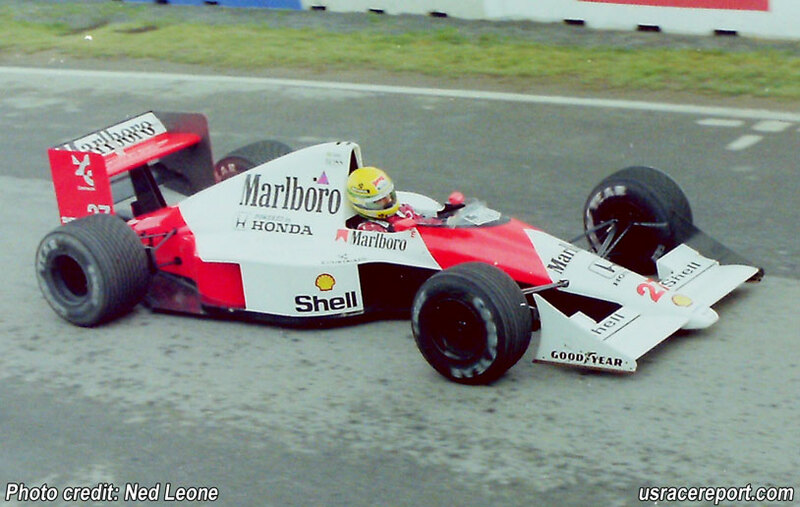 The closest that Senna came to that level of F1 prima donna was in 1993, when an engine snafu landed his McLaren team with an underpowered Ford engine. 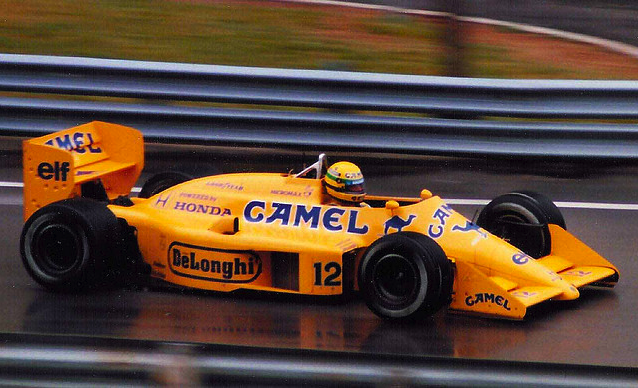 Senna began the year running on a race-by-race basis, then eventually agreed to stick with the team for the full year. He still finished second in the championship. But what truly set Senna apart was his humility and integrity, especially in comparison to other drivers. His rivalry with Prost will always be one of the most legendary in the sport, not only because of their on-track accomplishments but also due to their disparate personalities. 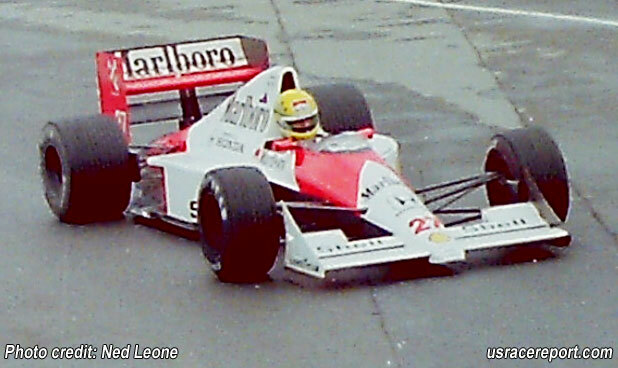 Started by a 1988 incident in Portugal in which Senna nearly forced Prost, then his teammate at McLaren, into the pit wall at full speed, the next few years were marred by various misjudgments by Prost and FIA president Jean-Marie Balestre, who, prompted by a Prost protest, temporarily suspended Senna’s license in 1989. At Suzuka, in 1990, the penultimate round of the championship, Senna led Prost, now with Ferrari, by nine points for the championship. While Senna beat Prost for the pole, Balestre himself elected to place Prost on the left-hand side of the track, the traditional pole side, which would have given him an advantageous line into the first corner. 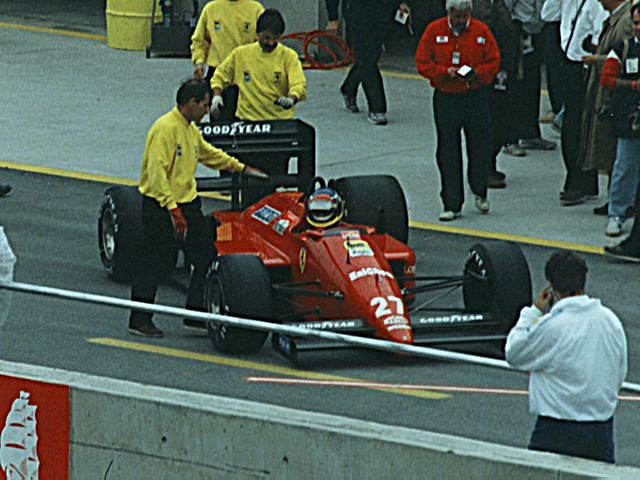 Senna protested by refusing to yield the racing line, plowing into the back of the Ferrari, eliminating both cars, and thus guaranteeing that he would win the championship. Senna explained a year later that he would not stand for Balestre’s unfair decision-making, dating back to the license suspension. If you tried to compromise the integrity of a race, Ayrton Senna would make your world a living hell. That integrity didn’t always frustrate his opponents or teammates, however. During that 1993 season at McLaren, Senna’s teammate was Michael Andretti, still in the prime of his career after winning the 1991 CART title. But McLaren had also signed Mika Hakkinen as a reserve in case Senna were to leave, and the future world champion was ready to race. In fact, son Marco Andretti has alleged that McLaren intentionally sabotaged Andretti’s car to drive him away—until Senna spoke up. “I think my dad’s biggest supporter over there was Ayrton Senna,” the younger Andretti told the Associated Press in 2008. “Because he was one of the few who knew what was really happening in the team, and I think he believed in my father. It was at Monza that he really said, ‘Give him my car. Give him exactly what I had. '” Andretti finished third in that race, scoring his only Formula 1 podium. An intensely focused competitor, Senna also had a lighter side, as he frequently played practical jokes on McLaren teammate Gerhard Berger. When Erik Comas crashed heavily in qualifying for the 1992 Belgian Grand Prix, Senna ran across the active track to become the first respondent on the scene, and later visited Comas in the hospital. He also felt a great responsibility to help eradicate poverty in his native Brazil, having donated a large portion of his wealth to aid poor children shortly before his death. Ayrton Senna has been gone for 18 years now, but his legacy will always carry on. His nephew, Bruno, carries on the family legacy, driving for the same Williams team with which his uncle ran his last race; meanwhile, a 2010 documentary bearing his name won awards at film festivals worldwide before finally receiving its United States release this March. But for those longtime fans of the sport who were lucky enough to see Ayrton Senna race, no driver and no documentary will ever come close to replacing him. Not Schumacher, not Vettel, not even his own bloodline. He may have denied his own immortality, but the rest of us never will. 2011 HIGHLIGHTS: Filippi ranked second in last year’s GP2 championship, the top feeder series to Formula 1. Switching to Scuderia Coloni midway through the season, he won three times and finished in the top six in seven of eight races. He also finished second in the Auto GP championship with Super Nova Racing on the strength of one win and six podiums. 2011 LOWLIGHTS: Filippi’s switch to Coloni in GP2 came after a disastrous first half of the season with Super Nova. Save for a third and fourth place finish in the two Monaco events, his record was underwhelming, with four retirements and four finishes outside of the points in 10 total races. SEASON OUTLOOK: After team owner Bobby Rahal struck a deal with Sarah Fisher Hartman Racing to give them his second engine contract and get them on the grid for the start of the season, the second Rahal car became a deal from the Indianapolis 500 on. Negotiations with Filippi had not yet been finalized in the first place, and it’s possible that missing a chunk of races lowered the price enough to get the deal done to bring the Italian to America. Filippi has hung around GP2 for the past six years, alternating good years with bad ones, but he broke out last year by more than doubling his career win total in only an eight-race stretch. His extended GP2 stay also means that he’s been in Dallara equipment for much of his career, which may make his transition to American racing a bit easier. He’ll have much to learn by watching teammate Takuma Sato from the paddock in the early rounds of the season, and the hope is that when Rahal’s second Honda engine arrives, Filippi will have observed enough to know how to get around. The biggest news of the day in international motorsports doesn’t usually belong to the IZOD IndyCar Series, unless it’s in relation to the Indianapolis 500. Today, however, IndyCar is at the forefront of the racing world, as Rubens Barrichello will suspend a 19-season Formula 1 career to join KV Racing Technology for the 2012 IndyCar season. 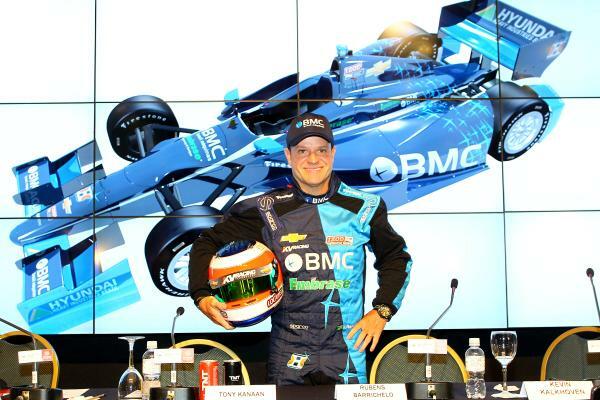 Barrichello, who will drive a #8 Dallara-Chevrolet backed by a Brazilian construction company, joins “brother” Tony Kanaan (the two are very close) and E.J. Viso at KVRT. It will be KV’s second big driver-related move in two years, after Vasser sprung for Kanaan last offseason when his ride at Andretti Autosport vaporized. Previously, KV had made a history taking on drivers who brought their own sponsorship, and the lineup didn’t always work according to plan; in 2010, Takuma Sato, E.J. Viso, and Mario Moraes combined for over 30 accidents during races and practice sessions. Now, their lead two drivers have combined for only 15 DNFs (Kanaan nine, Barrichello six) in 106 starts (Kanaan 51 in IndyCar, Barrichello 55 in F1) the past three seasons. Their ability to keep cars out of trouble on the track (only eight of those DNFs were accident-related) should have the team very confident about where they stand in the sport. In fact, Vasser may have, car for car, a more talented driver lineup than his former owner, Chip Ganassi. But beyond that, landing Barrichello is a huge caveat for IndyCar, as he is the first big name Formula One driver to defect to the United States since Nigel Mansell made the move in 1993. Mansell tore up the CART ranks, winning back-to-back F1 and CART championships. Barrichello tested the new Dallara DW12 multiple times for KV as an advisor in the offseason, having experienced some of the new engineering concepts in Formula 1, and really enjoyed the car. It also suggests that IndyCar’s safety improvements on the new car, made in the wake of Dan Wheldon’s tragic passing last October, have been significant enough to satisfy those worried about running open-wheeled cars on ovals. While his wife was initially concerned about the safety of running ovals, which could have resulted in a partial schedule, his kids reportedly convinced her to give the okay to run every race in 2012. That simply wouldn’t have happened if the car wasn’t deemed safe enough, and no amount of pleading from Barrichello’s kids would have changed that. Barrichello believes that some other Formula 1 drivers have interest in ovals, and that his switch to IndyCar (especially if successful) could open the door for other drivers to make the same choice in the future. That’s not to imply that these drivers will be mid- to low-level F1 drivers, as Sato, Justin Wilson, and Sebastien Bourdais were, either – Barrichello is referring to top talent in the sport. Mark Webber, Red Bull’s second driver, has been rumored on his way out for years now due to his age despite strong performances; he could be a candidate if those rumors ever come to pass. In the early 1990s, IndyCar was on par with Formula 1 for the greatest open-wheel driving talent in the world. Drivers like Rick Mears, Al Unser Jr., and Bobby Rahal established themselves well in solely American careers, while Mansell, Emerson Fittipaldi, and Mario Andretti brought Formula 1 pedigrees. The 1996 split between CART and the Indy Racing League undid a lot of the sport’s prestige, as drivers racing in America would look to NASCAR and the few CART drivers to earn F1 rides failed miserably. Barrichello’s signing, however, should do a lot to reverse that trend; not only will he bring a level of respect back to IndyCar, he should inspire other, better young talent to consider the series as a viable option once again. 2011 HIGHLIGHTS: The all-time starts leader in Formula 1 (322 races run since 1993) raced with the Williams squad for the second year in a row in 2011, alongside new teammate Pastor Maldonado. 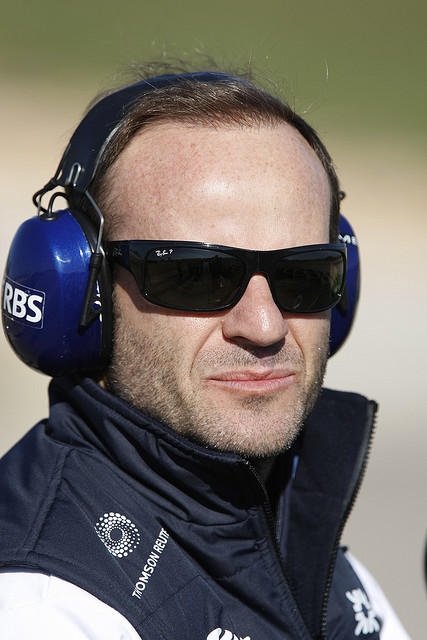 Barrichello managed a pair of points finishes at Monaco and Canada, both times coming in ninth place. As usual, his only retirements on the year came from parts failures rather than driver error. 2011 LOWLIGHTS: Barrichello could only muster four points, good for 17th place in the 2011 standings; while that topped teammate Maldonado’s single point and 19th place finish, it was enough to convince Frank Williams to replace the aging Brazilian with countryman Bruno Senna in 2012. SEASON OUTLOOK: Landing Barrichello is a huge caveat for IndyCar, as he is the first big name Formula 1 driver to defect to the United States since Nigel Mansell made the move in 1993. Mansell tore up the CART ranks, winning back to back F1 and CART championships. Barrichello tested the new Dallara DW12 multiple times for KV as an advisor in the offseason, having experienced some of the new engineering concepts in Formula 1, and really enjoyed the car. While his wife was initially concerned about the safety of running ovals, which could have resulted in a partial schedule, his kids reportedly convinced her to give the okay to run every race in 2012. Barrichello’s decision to join KV signifies Jimmy Vasser’s strongest play yet to become the next Chip Ganassi. After adding former IndyCar champion Tony Kanaan last year, Vasser now has another world-class driver in his employ, and he owes it all to Kanaan’s great friendship with his countryman. Barrichello has a reputation as a great teammate (remember all those years that he put up with Michael Schumacher at Ferrari), which should help E.J. Viso wring even more speed out of his KV car, and as a consistent driver who keeps his car together (only six DNFs in his past three F1 seasons). KV’s old reputation for tearing up two cars a weekend should be a thing of the distant past.